In what I'm sure was a well-meant gesture, Jetboy's lead singer announced my address over the PA system during this show. Perhaps he thought my plan to limit the after-show party to the several hundred people I actually knew was not a good one. 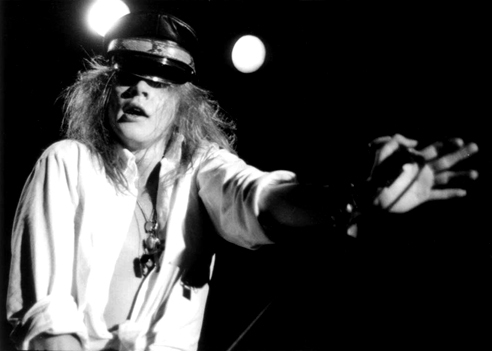 In any event, Axl Rose showed up, dressed in a pair of fetching black leather chaps. Just black leather chaps. He stumbled into my bedroom (it was a two-room apartment, so the odds were 50/50), and passed out on a pile of records - records I had not especially planned to throw onto a bonfire. I never understood why people liked GnR. I especially enjoyed this post. The quote is by Deborah Ostrov? This is sort of a mystery show. It apparently took place some time in 1986 at a club called The Stone (according to Ostrov) in San Francisco. I can't find any information on this venue, but there used to be a club called The Rock at Broadway street where Jetboy played all the time, so I am leaning towards concluding that Ostrov's memory is not all that. Still, even when searching for "The Rock" in combination with "Guns N' Roses" or "Jetboy" and 1986, I can't get any hits. Another thing, according to two different interviews with Slash they also played a gig in San Francisco in 1985 with Jetboy -- which is not included in my database, or anyone's else. A real mystery date. Even Marc Canter doesn't mention this gig. Normally I'd write it off on Slash's notoriously bad memory, but the thing is that he adds details suggesting the gig really took place: they apparently wrote Paradise City while in the car back to Hollywood (which should place this gig right before October 10, 1985) and the car was driven by Vicky Hamilton. So now I am searching for two gigs who are supposed to have taken place in San Francisco in 1985 and 1986, respectively, both with Jetboy. Well, according to Setlists.fm this The Stone gig took place on August 28, 1986. Whether there was a gig at the same venue in 1985, whicch Slash recollects, or whether he is just confused, I don't know. Davy Vain would comment: "I remember the gig because you [=Steven] and Duff hung out for our set and watched us, which was the start of the connection. When we were in L.A. wed always stop by and say hi, and I got to know Duff and Slash as well" [Hot Metal, December 1991].